Rockberry Apartment offers comfortable accomodation for two and a truly breathtaking uninterrupted panoramic view extending across the whole of Tor Bay to Portland (visability permitting). Situated on the South West Coast path and literally yards from the sea, Rockberry is ideal for couples wanting an active holiday. The apartment consists of a well equipped kitchen-living room, a quiet double bedroom and bathroom with a large separate shower. It is the top floor of a Victorian villa and is fully self contained. The helpful and friendly owners occupy the lower floors. There is free wi-fi available with this appartment. Unusually for Brixham, a single, free off road parking space is available with this property. This apartment is ideal for couples looking for a special place with a wonderful sea view to enjoy. The Rockberry Apartment is a top floor flat of a Victorian villa. It is fully self contained and has it's own enterance via a spiral staircase. Brixham is a picturesque fishing town set in an outstanding coastline. The town has a number of good restaurants within walking distance of the apartment. Dartmouth, Torquay, Totnes, the River Dart, the South Hams and Dartmoor are all easily accessible. Rockberry is situated on the Shoalstone side of Brixham, a short walk past the harbour and marina from the centre of town. The Shoalstone sea water swimming pool is approximately 200 meters away. Breakwater Beach (swimming and scuba diving) is a couple of minutes walk away. Shoalstone beach (scuba and snorkelling) and Brixham Marina are also within a few minutes walk. Berry Head Country Park, a site of special scientific interest, with lovely walks and more fabulous views is a 10 minute walk away. Brixham is an ideal location from which to enjoy an active holiday. Fishing, diving, swimming, sailling and boat charters, golf, go-karting and great walks are all easily available. There are a number local regattas throughout the summer season. In addition there is the Brixham Heritage week, the Steam Fair and other local shows and fesitvals. The apartment features a fitted quality kitchen with built in appliances including a four ring hob, full sized oven, fridge with ice box, dishwasher, washer-dryer and a separate microwave. There is dining seating for four people. The living area has a comfortable leather sofa, two leather arm chairs and a large wall mounted flat screen TV with a DVD player. The bedroom over looks a quite garden area. It has a comfortable large double bed with a quality mattress, a chest of drawers and a built-in wardrobe. The bathroom has a full sized bath and separate large shower. Large shower enclosure and separate bath. The property is fully centrally heating. Heating is avilable at all times. Quality fitted fully equiped kitchen with 4 ring hob, microwave, refridgerator with ice box, slim line dish washer, washing machine. Wonderful views over the Bay may be enjoyed whilsh eating. Flat screen Panasonic tv available. NB: ACCESS TO THE APARTMENT IS VIA AN EXTERNAL 5 METRE SPIRAL STAIRCASE. The Rockberry Apartment is on the South West Coastal footpath. It is within a few minutes walking distance from the Marina and harbour, Breakwater beach, Ladybird Cove, the Seawater Swimming pool, Shoalstone Point and Berry Head Country Park (a site of Special Scientific Interest). It is idealy situated for people wishing to enjoy the local coastline and sea. Brixham an historic town with a busy fishing industry. It has a picturesque old harbour which, not surprisingly, is overlooked by a number of good fish restaurants. During the summer period passenger boats can be taken to Torquay, Dartmouth and the River Dart. The town also has a heritage fleet of sailling trawlers. 'The Vigillance' is available for short sailling trips around the Bay. 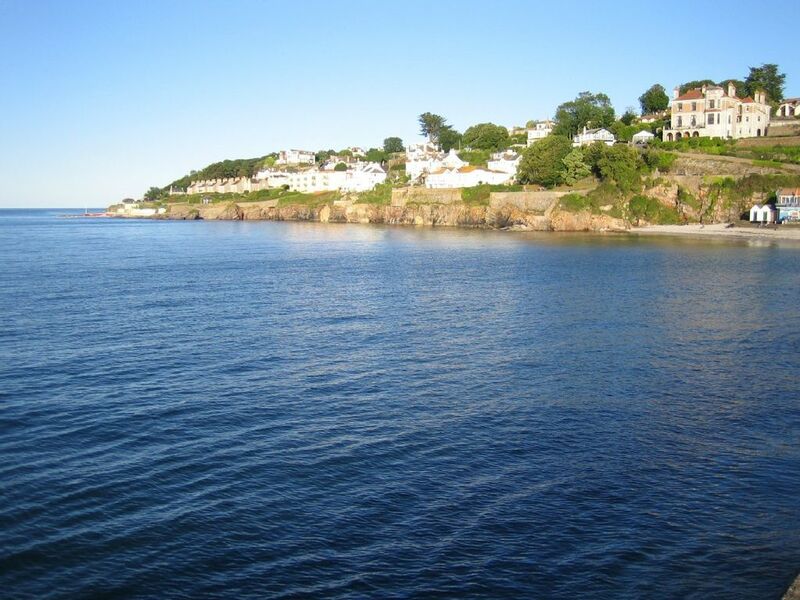 The town is located on the southern side of Torbay within the stunning South Devon coastline. Brixham is also well placed to explore the interior of South Devon. Only weekly bookings are normally accepted from April to October. For weekly rentals a Saturday change over is preferred but may be negociated by arrangement if necessary. Short breaks or weekends may be accepted at other times of the year. Please email for prices. A cheque for 50% of the total price is required to secure a booking.